Hi there! 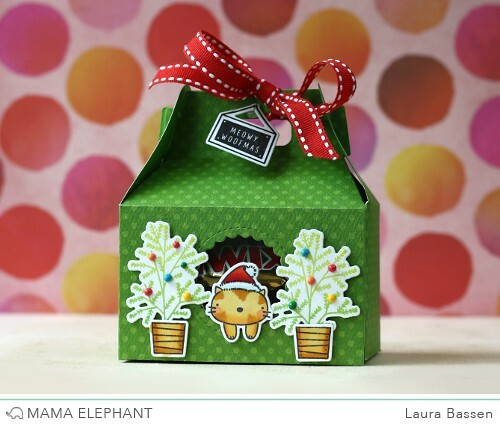 Laura here and today I have a fun little gift box to share using the Gable Box creative cuts. 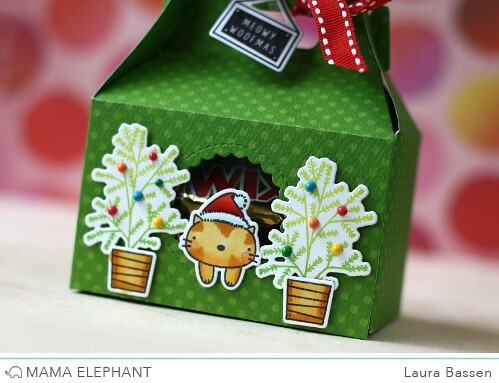 I used one of the circle dies in the Gable Box to make a window in the box and added some images from the adorable Meowy Woofmas stamp set. Here's a video to show you how I made this cute box. So adorable your little girl! The apple don't fall far from the tree. Go Wonder Woman with the red lipstick!! O, yeah, the box is super cute too. Great job, Emma. I loved your video. Hope you had great fun Trick or Treating. Looking forward to your next video. Hahaha! That apple didn't fall far from the tree! She's almost as funny as you Laura! Love the "ordaments" on the tree. What an adorable box! That cat hanging out of the window is purrrfect! My gosh, you sure do have some cute stamps, and make adorable examples of what we can make!! She is her mother's daughter!!! When the video first started, I thought "what is wrong with Laura's voice". Hahaha, classic.